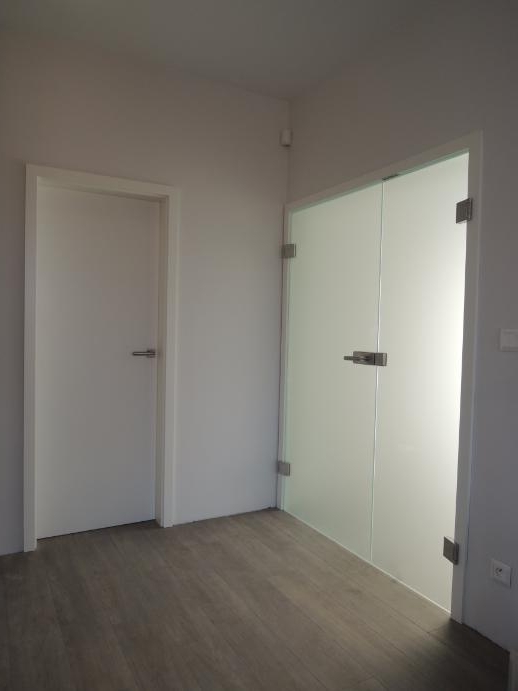 In MyColourGlass we offer high quality frameless glass doors. Glass doors give an amazing stylish look to any room in your home and let the light flood, giving you much better feeling of space. 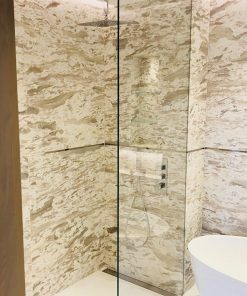 Our frameless glass doors are individually made to measure and made to specifically fit your opening with 8,10 or 12 mm toughened glass (depending on the application). We are cutting it to the exact size required. Also drill and notch for hinges and door handles and we can add EasyClean coating or sandblast if necessary. Hurry up and get a completely free quote from us. Bespoke glass doors are custom made to fit your needs when it comes to entrances and exits. 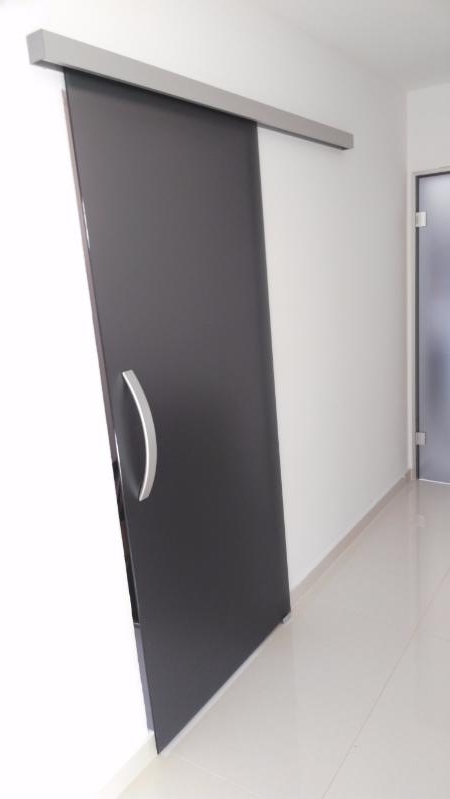 You can also used these doors on any room, such as the kitchen area, or library. All glass doors are custom measured with excellent precision tailored to your door opening, where ever it might be. The wonderful thing about these doors are the fact that they are “frameless”. This is the ultimate in modern design. No need to be concerned with swelling wood frames or the other inconveniences of the “old fashioned” doors or entryways. These look especially nice as double doors on the front of your dwelling, or business, led up to with a rock path or brick walk way. You might even add more pizazz to your entrance way with the use of low laying lights and glass balustrades (which we also offer) leading the way. Ferns and plants on the interior and exterior will complete the picture as they take advantage of the natural lighting. Bespoke means “made to order” and the frameless glass doors by “MyColourGlass” certainly show their expert skills in custom glass work. Let’s look at how this is applied when it comes to high quality and outstanding features. Made To Measure– Each door expertly crafted at MyColourGlass is specifically measured to fit your door opening and needs. No details are left out, and the ultimate in craftsmanship is our signature when it comes to supplying quality workmanship and precision cutting. We also offer sliding glass doors and frameless glass shower doors with the same precision custom fit. 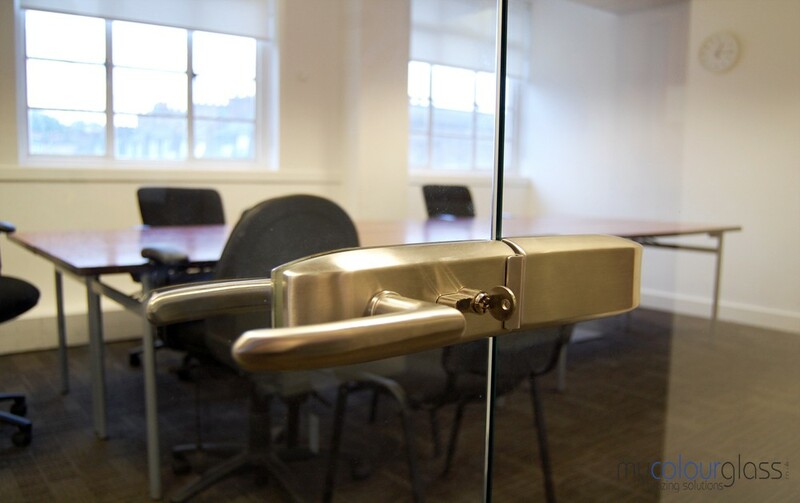 Hardware for Frameless Doors– Many styles and designs of durable hardware are available to you at MyColourGlass to fit your decorative needs. It is our courtesy in supplying the best. 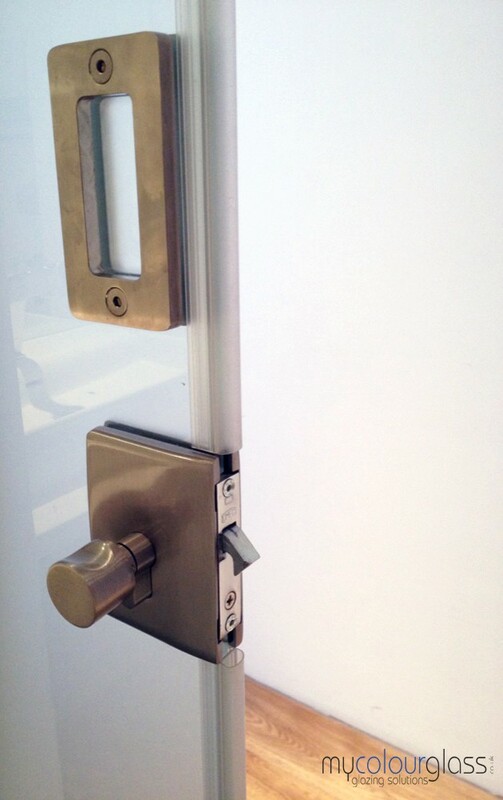 The drilling and notching for your precision cut glass door are perfectly fitted without any error when it comes to door handles and hinges which work and perform to the highest degree. Glass and Glass Finishing– Toughened glass is used in the construction of our “frameless doors”. It comes in 8,10, and 12 mm, when it comes to thickness. We ensure that the best thickness for your usage will be applied. If you like the “sandblast” finish for your toughened glass door, we also offer that as an option in style and design. We can even add an “EasyClean” coating as one of our special offers. The colors, tints, and finishes are all up to you, and our selection is immense. Shop around MyColourGlass, and let your creativity flow for the best in use and decorative flair. Glass doors allow natural light to enter and aesthetically open up areas. Say goodbye to fake florescent lighting and experience pleasing shades of natural light streaming in. If you want you can even accent the interior areas with specialty lighting as a decorative plus, and spotlighting only as desired. Colored or tinted glass room dividers and screens play up nice with bespoke glass doors. Custom made glass doors are definitely a good overall investment. Anyone that uses this kind of doors can tell you how big of a difference they make when it comes to allowing natural light into the home. Natural light is always better compared to the artificial, but it also brightens the place and make people feel more comfortable. According to many studies lack of natural light and living in dark closed spaces leads to depression if people spend too much time in these places. Therefore having a glass door in your living room can really change the atmosphere and your mood. Speaking of natural light coming through your glass door we can’t miss to mention the energy saving benefit this can have. Since there are so many rainy days in the UK a place with glass doors compared to a closed place can make a huge difference. The glass doors without frame allow so much natural light during the day that for the most of the time you won’t need to turn on the artificial lights which can potentially lead to reducing energy consumption during the peak times. The frameless glass doors open up your space. It makes your rooms look much bigger and provides you with a good view of your outdoor place. This is why they are preferred by people that need doors for small places. No one wants to feel claustrophobic or cramped. Are glass doors tempered or toughened? Is there a difference? Tempered and toughened glass are basically two terms for the same thing. Manufacturers produce them by heating an ordinary glass to 600 degree Celsius and then quenching it with water to make it very strong. If you look around you will find that they use them not only for doors, splashbacks and glass balustrades and other architectural domains but also in the automotive industry. The glass doors, no matter sliding, frameless or patio doors are completely safe. This is because the tempered glass has a unique feature of breaking into small pebble-like parts upon serious impact, which is protecting people using it from harm. This is why the automobile industry is using them. The glass doors will always be safer if you compare them to the other alternatives. 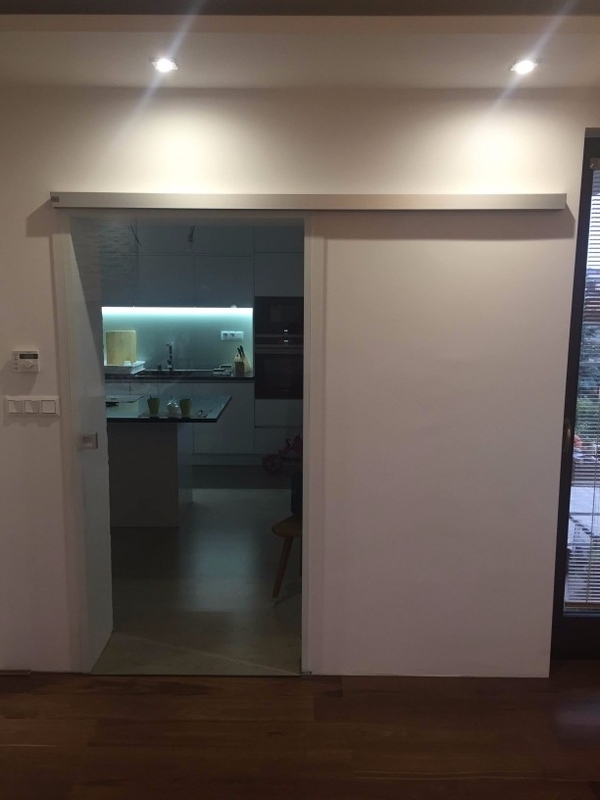 We are also offering a wide range of bespoke sliding doors. You can use them for interior as well as doors for your patio. A sliding door without frame can give your home a contemporary twist, transforming the look of your place. 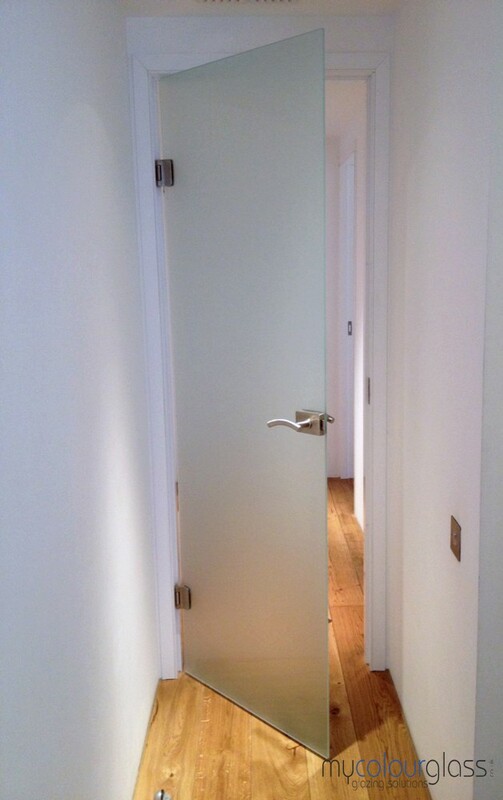 We design our frameless doors to fit and are simple and easy to install. Sliding glass doors are perfect for small spaces. 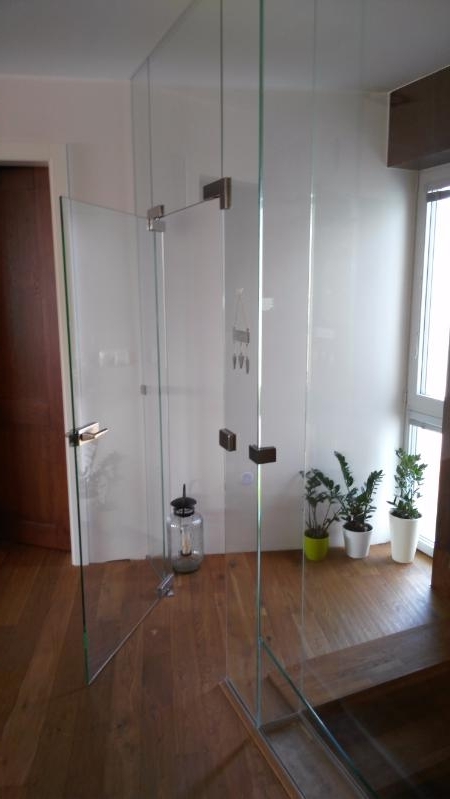 Using glass for your shower doors is the best decision that you can make for your bathroom. Glass is easy to clean therefore it will save you a lot of time. Many of our customers are choosing this option exactly because of this reason. You can also customize them which gives a whole bunch of opportunities. Don’t limit yourself to the mass produced shower doors with standard sizes. We are adding more flexibility to your shower installation. Frameless shower glass doors look much better. Framed shower doors always look bulky with rubber, metal, wood or other material always covering their edges. If your bathroom remodel includes a nice looking shower tile design, the glass doors can help you showcase it. They also minimize the mould risk by minimizing the places where mould can grow. Glass interior doors are a favorite at MyColourGlass and fast becoming a feature of every home and business. They are not only stylish but let light in on the many over cast days in the UK. You can also get lovely glass shower doors for the ultimate in good looks and sleekness for your showering space. Be sure to ask about our “frameless” showers when you call and get your free quote or advice. A phone call to us does not in anyway obligate you to buy a product or under go a “sales pitch”. Many of our clients on the phone are referrals, or seeking to ask questions about design possibilities and ideas. We are here to be of service to you and share the wonderful world of MyColourGlass. Take your time and shop around a bit, read our blog, and enjoy yourself. Interior design can be very rewarding and a worthwhile investment when it comes to your home or office space. We serve both residential and commercial clients. 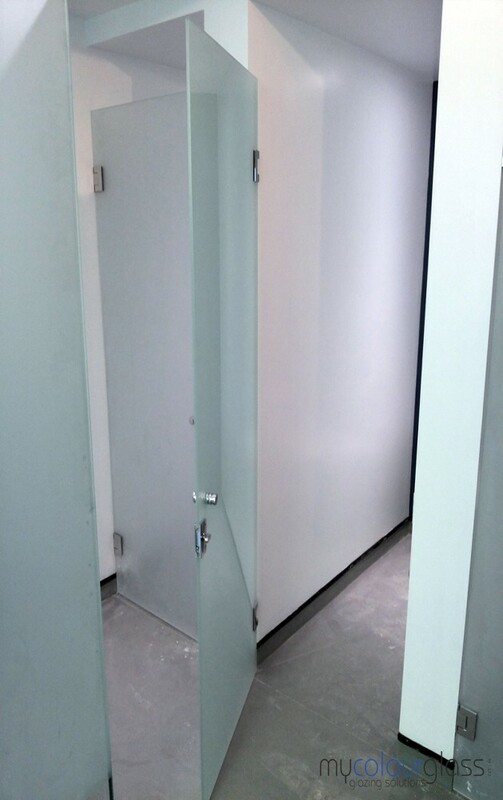 Toughened glass is very durable and custom cut for your interior door usage. They are very safe and add to the value of your home or business for many years of use with the best in interior design options. Browse our photos and enjoy the lovely appearance of glass doors. 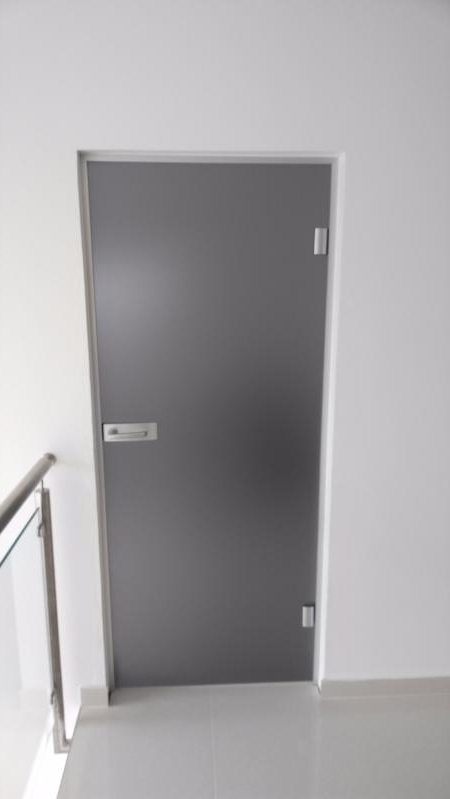 Our doors are made of 8, 10, or 12 mm toughened glass. We help you decide the best thickness for your individual use and interior design options. We are here to guide you through any glass work you may decide to use in your home or business. 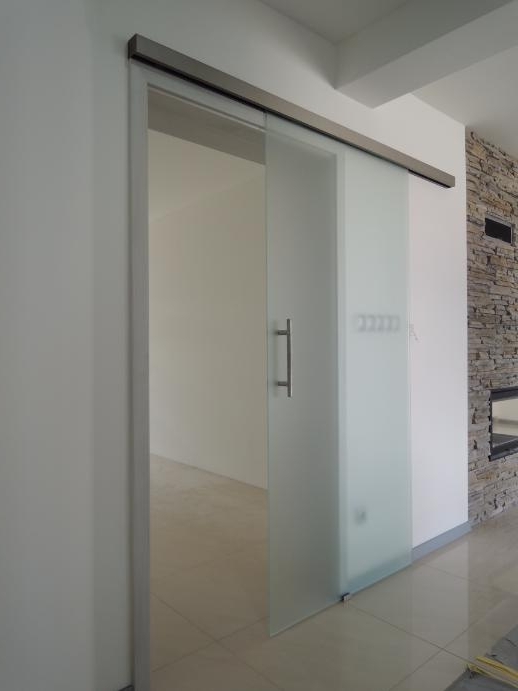 Lets look at a few of the choices when it comes to frameless glass interior doors. Clear or Tinted Glass – Even though we offer an abundance of colours at MyColourGlass for all of your glass work, many seem to choose clear and tinted glass for their interior frameless door use. Whole glass partitions are sometimes used to separate areas of the home or office. 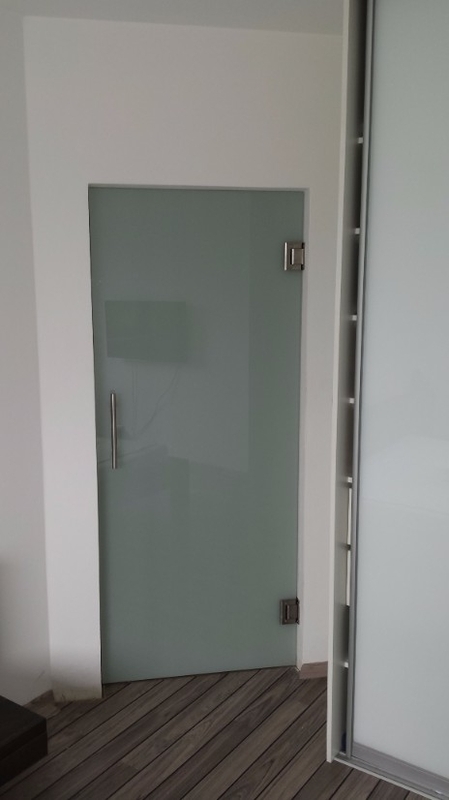 Frameless glass doors are the answer when it comes to adding to this beautiful and lasting design. The hardware needed to complete your finishing touch is also readily available through MyColourGlass. Ask our experts and they will share the knowledge through valuable years of “know how” when it comes to glass interior doors. Sandblasted Glass Interior Doors – Sandblasting is an exceptional offer through MyColourGlass for interior doors. 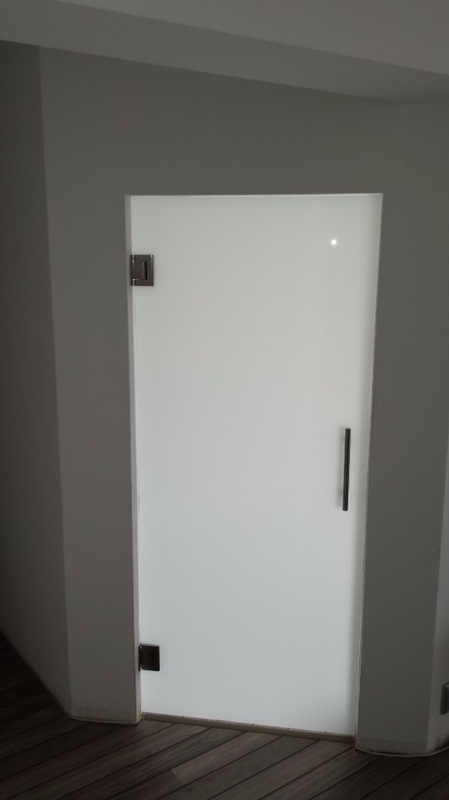 You can create a special “frosted” look with the help of our interior design specialists whom are waiting to help you find that unique interior glass door or glass doors for all of your practical and lovely design choices. 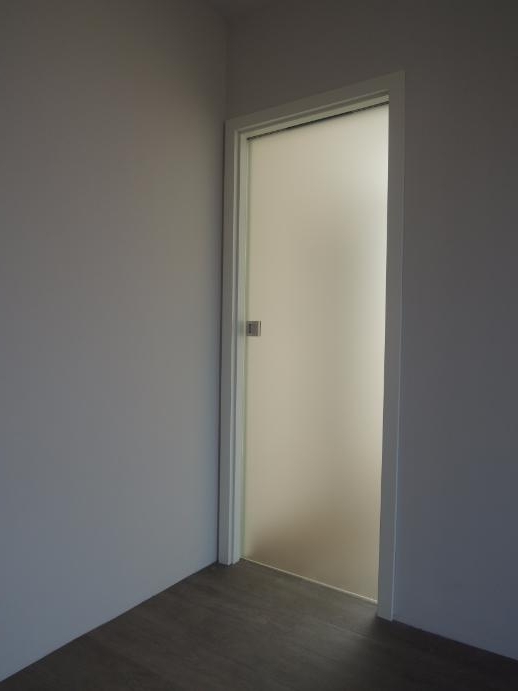 We have special finishes, if you so desire, to add a special “easy-to-clean” finish, even though all of our glass interior doors are naturally easy to maintain and keep clean. If you are seeking the very best in contemporary design which will last for years to come, you will definitely want to use glass work in your design options. 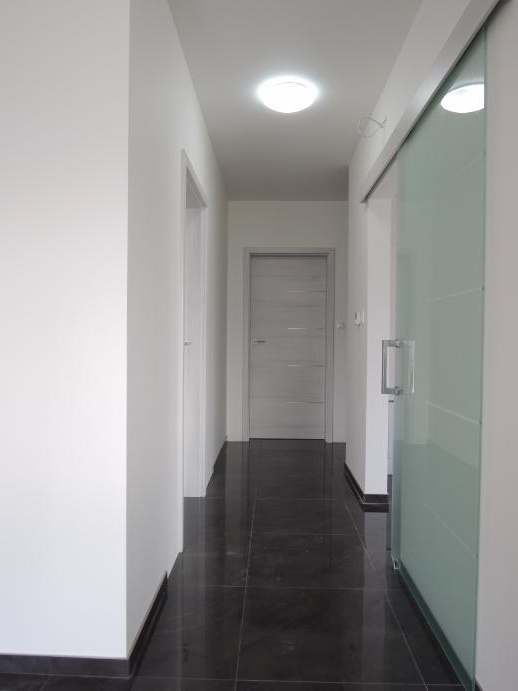 Glass interior doors open up space and add aesthetic value and are a must in the most contemporary of settings. MyColourGlass has years and years of experience installing all kinds of glass products to thousands of homes in the UK. You should definitely trust us with your project. We have a bespoke design services with guaranteed high quality to help our creative customers make their vision. You can contact us at any time and discuss your projects with us. We are helping you with the whole process. From ordering to completing your vision. If you are in these areas we are providing installation otherwise customers can buy our glass products and we ship them to you. We are not leaving before you are completely satisfied with your project. We are making all of our products right here in the UK at lowest price possible. Go get a quote from our site! It’s free! We have great reputation. If you don’t believe us you should check our great reviews and if you want to get inspired visit our Houzz profile.